Fresh, wild-harvested, hand-rolled pure white sage! Only the best! White Sage is becoming rare due to wild fires out west. It has gone up in price drastically. 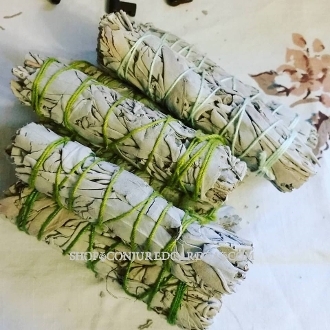 This sage was hand collected with respect and intention in the mountains of California White sage used in "smudging" has long been used for purification of self and space. This natural incense is the best way to prepare for ritual or to simply recharge.Our Native elders have taught us that before a person can be healed or heal another, one must be cleansed of any bad feelings, negative thoughts, bad spirits or negative energy - cleansed both physically and spiritually. This helps the healing to come through in a clear way, without being distorted or sidetracked by negative "stuff" in either the healer or the client. The elders say that all ceremonies, tribal or private, must be entered into with a good heart so that we can pray, sing, and walk in a sacred manner, and be helped by the spirits to enter the sacred realm. Native people throughout the world use herbs to accomplish this. One common ceremony is to burn certain herbs, take the smoke in one's hands and rub or brush it over the body. Today this is commonly called "smudging." In Western North America the three plants most frequently used in smudging are sage, cedar, and sweetgrass. Leaves are lit and set to smolder in a heat safe dish (such as an abalone shell, clay or metal dish lined with sand to disperse heat) or burnt on a charcoal briquette. The most traditional incense and way to purify one's self and space. Listing is for one, 5 inch sage bundle. *The listing is for the first two photos only.